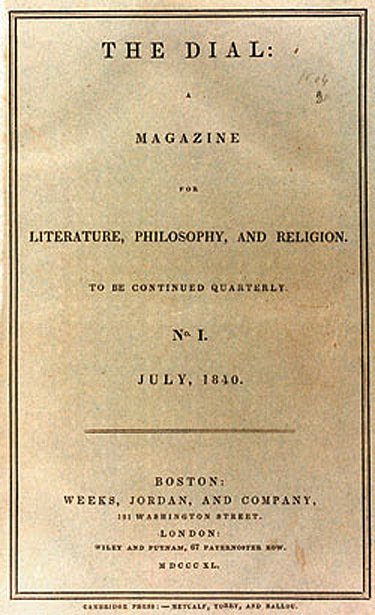 America hadn't created many literary movements by July 1840, when Ralph Waldo Emerson and Margaret Fuller began publication of an idealistic journal of social criticism and poetry called "The Dial". Based in Concord, the journal was published on a quarterly basis between July 1840 and April 1844, and helped to create the sense of an exciting movement of writers, theologians and intellectuals working together to promote their ideas. Other key members of this group included Bronson Alcott, Orestes Brownson, Elizabeth Palmer Peabody, James Greeman Clarke, George Ripley, W. E. Channing and W. H. Channing. This movement became known as American (or, New England) Transcendentalism. The term 'Transcendentalism' had earlier referred to a group of German philosophers such as Fichte and Schelling who espoused similar ideas. Schelling's 'System of Transcendental Philosophy' is highly abstract, and in fact the younger New England thinkers had most likely encountered this philosophy in literary treatments by advocates of the movement such as Goethe, Coleridge and Thomas Carlyle. Transcendentalism has also been seen as an American outgrowth of the British Romantic movement and other European progressive trends. This was twenty years before the civil war, and the abolition of slavery was an all-encompassing political and moral crusade to virtually all the Transcendentalists, perhaps in a similar way to which the Vietnam War was a universal theme for the musicians and writers of the 1960's. Socially, the Transcendentalists stood for equality of women and innovation in the educational system. Philosophically they inclined towards a Platonic sense of idealism. In terms of literature and art, they were sympathetic towards the same styles the Romantic writers of England were experimenting with. Henry David Thoreau, Walt Whitman, Nathaniel Hawthorne and Herman Melville are often considered part of the wider Transcendental circle, and all were to varying degrees associated with the Concord crowd (especially Thoreau, a native of Concord). But none of them were charter members of the original group, of whom Emerson remains the characteristic figure. American Transcendentalism also formed the prototype for numerous American counter-cultural literary movements to follow, including the Harlem Renaissance and the Beat Generation. Finally, here's an essay about God that was born in the message board for this section. No Responses to "Transcendental America"
Jennifer Ratner-Rosenhagen examines the rising reputation of German philosopher Friedrich Nietzsche in the United States of America after his lonely death. Philosophy Weekend: What is the Meaning of Scientology? Alan Bisbort examines two recent books about the strange and largely unknown Church of Scientology.